This dish is a variation of Chicken Marsala and is a one-pan chicken dish with mushrooms, all cooked in a pan with wine and chicken broth. This dish is so easy to prepare, and is so delicious, as well as budget friendly. In a large cast iron skillet, heat oil and 1 tablespoon butter over medium heat. Working in batches, cook the chicken thighs on both sides until the skins become brown and crispy.Transfer to a plate and set aside. Reduce heat to medium, add garlic, thyme, mushrooms, and remaining 2 tablespoons butter, cook until softened.Add wine, broth, and return chicken to pan along with any accumulated juices. Season with salt, pepper, and cook,until the broth is reduced by half. To serve, ladle broth and mushrooms into a pasta bowl.Top the broth with one chicken thigh and top the dish off with chopped parsley and serve immediately. 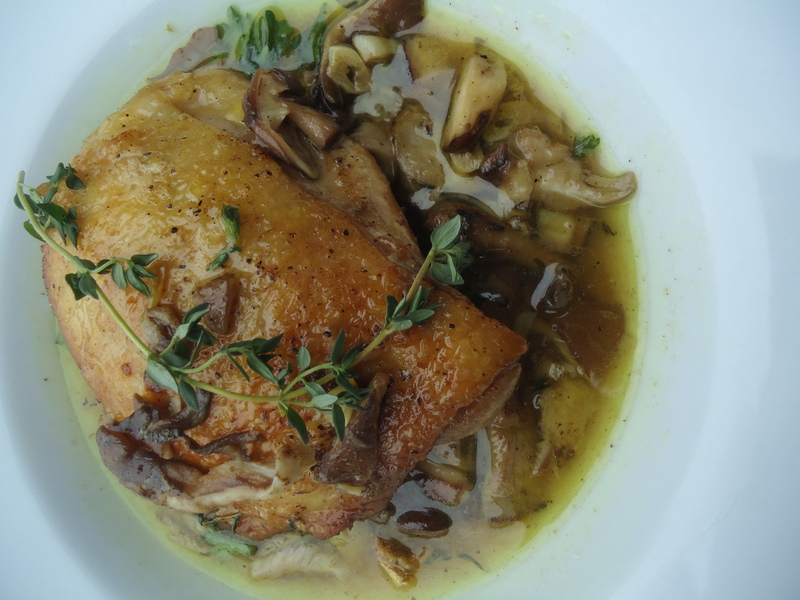 This entry was posted in Main Dishes and tagged Chicken thighs, Curly Parsley, Garlic, Shiitake Mushrooms, Thyme, White wine. Bookmark the permalink.